About 2 years ago I was looking for a truck to plow my driveway,(that is to plow the snow off my driveway). I had never even thought of getting a Willys pickup until the day I saw one. Trying to talk my wife into it was not easy,she was very reluctant to purchase a 33 year old truck for anything. I on the other hand saw more than a truck there. Like Rick, I was looking for a real truck, not a toy. 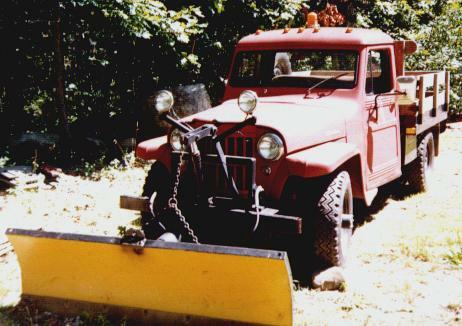 I bought the truck, a 1962 or 63 (I've never really been able to narrow it down any further than that) Willys P/U. It was converted to 12 volt and had a wooden stake bed put on, other than that as far as I can tell the rest of the truck is original. It has a Flathead 6 cyl. 226 super Hurricane engine. It starts and runs great. I have had radiator repaired and the generator rebuilt. Other than that I've changed the oil a couple of times and gas it up now and then. I would like to do a frame off restoration, however, I'm afraid I lack the confidence for such an undertaking, not to mention the $$$$$.